There is no easy way to say 捏面 (nie mian) in English! It literally means ‘pinch flour’ but in fact, this folk-craft, which dates back to the Han Dynasty, involves a lot more than just pinching! The ‘clay’, actually dough, was traditionally made of glutinous rice and colorings made from different foods. The final product, beautiful though it was, could be eaten. Today, certain additives such as honey and paraffin might be added to improve the longevity of the final product, and they definitely can’t be eaten! 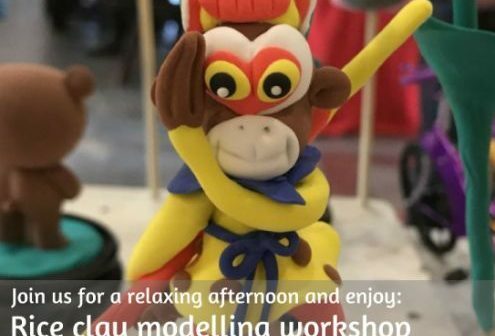 You can learn to make a Sun Wu Kong (Monkey King) figurine and more using traditional techniques at our workshop at Culture Yard on April 21st. Price: This CK Cultural Treasures Workshop is just 288RMB for adults and 258RMB for children under 16. The price includes an English language presentation on the history and culture of rice clay figurine-making and the Monkey King; a two-hour workshop with an expert teacher, snacks and drinks. If you have any questions, or would like to confirm your place, please email us at events@culturalkeys.cn. Alternatively, add AJDonnelly on WeChat. Cultural Keys is an expat-run Chinese culture school that helps you not just see China, but experience it too, by offering the most authentic classes in traditional Chinese culture available in Beijing. Cultural Keys aims to help people better access, understand and enjoy life and traditional culture in China, through information, classes, products, and services. From cultural classes to corporate training, whatever your reason for interest in this fascinating country, Cultural Keys can offer you an in-depth and immersive way to experience it. At our culture center in Xiaopu Art Village, in the east of Beijing, we organize unique classes and events to help people experience the most authentic traditional Chinese culture possible. We are happy to offer our classes and workshops for booking by private groups, corporate institutions, schools, hotels and event organizers, both at our center or at your location of choice. We also hold monthly workshops in various aspects of Chinese culture, also at our culture center.